Here's a reformatted, tidied and corrected version of the original post (which still exists here on the Screen Screener (now Big Screen Screener) blog.) Screen Screener was a blog that looks at film and television. In June 2010, Universal and Illumination Productions release an animated film about a Super Villain: Despicable Me. Come October, an animated Super Villain film Megamind. "Our battles quickly got more elaborate. He would win some, I would ALMOST win others! He took the name: Metro Man, defender of Metro City. I decided to pick something a little more humble: Megamind, incredibly handsome criminal genius and master of all villainy!" ~ Megamind, Megamind. A more poetic name. Cute. The name of the villain. OK.
"When we got adopted by a bald guy, I thought this would be more like Annie." ~ Edith, Despicable Me. A failure of Super Villain becomes the reluctant guardian of 3 cute orphan girls while he attempts to steal the moon. A Super Villain finally defeats the Super Hero but discovers that winning isn't everything he hopes for. Megamind mind's plot is a bit more Villain based and interesting. "The physical appearance of the please makes no difference." - Gru, Despicable Me. Both great animation. However, as much as I don't like 3D, the Minions trying to reach out of the screen at the end is a great use of animation and 3D and makes the winner here: Despicable Me. "Presentation!" ~ Megamind ~ Megamind. For this category I will be using "The 10 Rules to Tell If A Character is a Super Villain"
Both Gru and Megamind only go by one name in the films. The cooler villain name, though, is Megamind. Both Gru and Megamind have a distinctive look. Gru's is more a propaganda poster villain, while the more Super Villain look has to go to Megamind. Both had big cool vehicles. The people, in the end built a monument to Megamind (which doesn't count because it wasn't his ego that did it). Gru had a house with a secret underground lab, Megamind had a secret hideout. Tie. Gru had a OK childhood with an emotionally abusive mother. Growing up in gaol probably counts for Megamind. Gru wants to be known as the greatest Super Villain, which is slightly beaten by the wanting to run things of Megamind. Stealing the moon would be an environmental disaster, again, the winner is the wanting to run things of Megamind. Both are pretty shy and withdrawn, but the one that shows any charisma is Megamind. Both show this, but Gru does have to steal his shrink ray and has Dr Nefario helping him, while everything seems to come from Megamind. Both are action heroes in the end, more so Megamind. "I'm the bad guy! I don't save the day, I don't fly off into the sunset, and I don't get the girl! I'm going home." ~ Megamind, Megamind. Gru was the Super Villain in Despicable Me. Megamind was (unsurprisingly) the Super Villain in Megamind. Both are fun and interest characters. Tie. Tighten was a more complex character, but Vector was more fun. Tie. Kyle is Gru's toothy pet dog, Minion is Megamind's toothy pet fish & henchman. Dr Nefario is Gru's henchman, Minion is Megamind's pet fish & henchman (but I think I've already covered that). Just because he's doing the work of 2 characters, I'm giving it to Minion (Megamind). The Minions are Gru's assistants. The Brainbots are Megamind's. The Minions are the classic animation slapstick cuties. The Brainbots are mostly functional. Although unoriginal they are effective breakout characters: Minions (Despicable Me). No equivalent in Despicable Me. "Oh, my gosh look at that fluffy unicorn! He's so fluffy I'm gonna die!" ~ Agnes, Despicable Me. "It's like my heart is a tooth and it's got a cavity that can only be filled with children." ~ Gru, Despicable Me. It's animated and for kids. "You're so naive, Roxy. You see the good in everyone, even when it's not there. You're living a fantasy. There is no Easter Bunny. There is no Tooth Fairy. There is no Queen of England. This is the real world, and you need to wake up!" ~ Tighten, Megamind. Flow of parodies of the superhero genre and animation. "All men must choose between two paths. Good is the path of honour, heroism, and nobility. Evil... well, it's just cooler." ~ Megamind, Megamind. 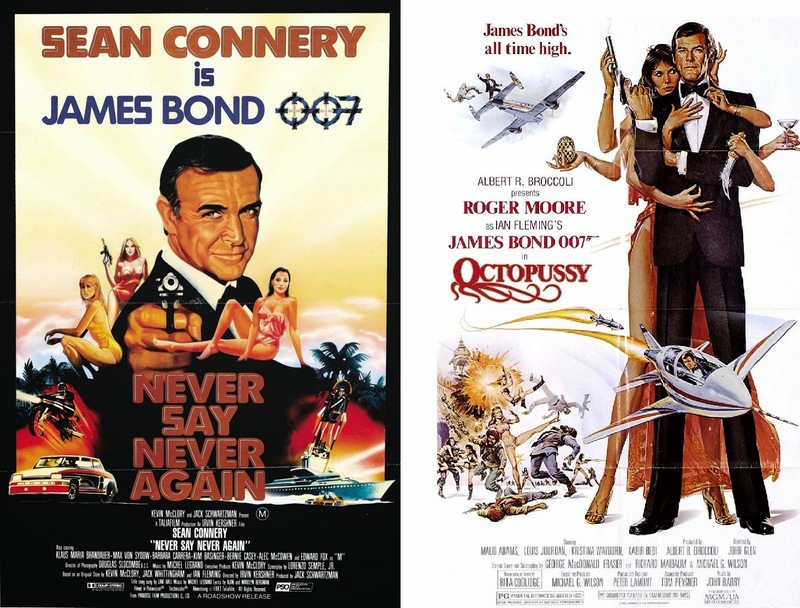 Without knowing why there are two films, it's hard to pick a moral victor. Despicable Me, however, was the first film by Illumination Entertainment, while Megamind was yet another Dreamworks Animation film, so let's give this one to the little guy. "That was you, wasn't it? Or was it a villain who's actually successful?" ~ Gru's Mum, Despicable Me. There is often a feeling that the second film released is a knock-off of the first or that film-goers will watch the first film and not bother with the second. The numbers for this duo may bear that out. Although it should be noted that both were the #1 film their opening weekend. An obvious win by Despicable Me. Despicable Me: $69 million (787%). Not only cheaper to make, but made more money, Decipable me is the obvious winner. "This is literature? A two year old could have written this!" ~ Gru, Despicable Me. Although a bunch of wins by Despicable Me, still a strong result by both. This town isn't big enough for two supervillains!" ~ Tighten, Megamind. Comic Book the Blog - Despicable Me vs Megamind: Despicable Me. 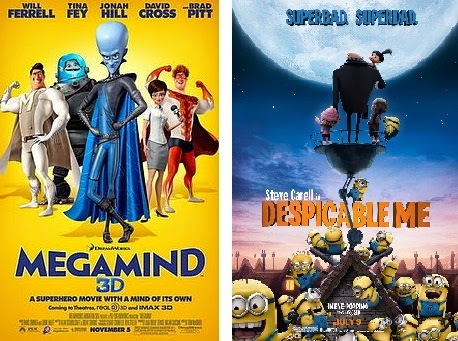 Embrace Your Geekness - Megamind vs. Despicable Me: Megamind. Great Fun For Kids: family movie night - despicable me vs megamind: Despicable Me. I am known for being AWESOME!! - Megamind vs. Despicable Me: Despicable Me. Khanversations - Megamind vs Despicable Me and Words in the Dust vs Wanting Mor…: Megamind. The Morning Call - 'Despicable Me' vs 'Megamind': Draw. The Real Mag - Despicable Me vs Megamind - Mega Review: Megamind. A Space to Breath - Despicable Me vs Megamind: Megamind. "YOU DARE CHALLENGE MEGAMIND?" ~ Megamind, Megamind. Do the poll for which 2010 Animated Super Villain Film you prefer. Obviously, it makes no difference to the overall score, but it would be interesting to know.